International Center Livingston Munnings (C-92) had a great game in the last round for Rockets, receiving a Interperformances Player of the Week award for round 4. 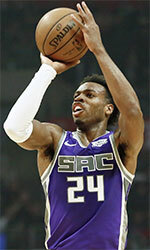 The 26-year old player had a double-double of 29 points and 21 rebounds, while his team crushed, the league's bottom-ranked team Pros (#9, 0-4) with 24-point margin 106-82. Thanks to this victory Rockets moved-up to the 4th position in Bahamas NPBA. They would have been even better if they hadn't lost two games earlier this season. Rockets will need more victories to improve their 3-2 record. In the team's last game Munnings had a remarkable 70.6% from 2-point range. It's his second year at Rockets and it's hard to imagine this team without him. Livingston Munnings has solid league stats. He is in league's top in rebounds (4th best: 12.8rpg) and averages impressive 3.8bpg,2.8spg and 51.7% FGP. The second best player in last round's games was American Dominique Fernander of Pirates. Fernander had a very good evening with a double-double of 21 points and 16 rebounds. It was enough for Pirates to edge the lower-ranked Shockers (#8, 1-4) 83-77. Pirates' 5th position in the standings has not changed. His team lost some distance to top teams. But 2-2 record is not bad and everything may still change. Fernander is one of the most experienced players at Pirates and has a reputation of one of team's most reliable players. He belongs to the best scorers in the league with 19.0ppg (#7). His other stats are also decent: 13.5rpg and 4.0apg. 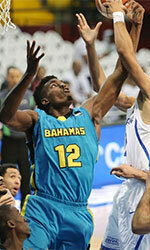 Third on the list of top players last round was Kemsy Sylvester of league's top team Bahamas Univ.. He scored 25 points and grabbed thirteen rebounds (!!!). He was a key player of Bahamas Univ., leading his team to a 87-84 win against the lower-ranked Shockers (#8, 1-4). Bahamas Univ. started extremely well this year. They recorded 4 victories without losing a single game. turns to be one of the very best players in the league while he is also a leader of the top team having his eyes on the championship title. has a great season in Bahamas. After only 3 games, he made it on the list of the league's leaders in points with 20.3ppg (best scorer), rebounds with 9.3rpg (#1 in league) and assists with 5.7apg (best passer).